Well, yesterday I placed one of my Wii remotes onto the induction panel only to find that in about 5-10 minutes time, a flashing red light caught my attention. Now anyone that works with ANY electronics at all can deduce that "red flashing light"...is NEVER a good thing. Especially those Xbox 360 fans out there. Now keep in mind, I have only charged this particular Wii remote maybe 4 times MAX since I bought this charging system. (I don't play the Wii very much) To find that the battery pack was hosed after only 3 or so charges left me quite angry as well as surprised to even see the "Energizer" name branded on such an embarrassing device. *Being as I do not want to go out and buy more induction battery packs as I am certain I will continue to see this same flaw, I decided to do a little testing. Test 1 - Battery power: I first removed the battery pack from the Wii remote and used a simple battery tester (re-charge/fully charged type device) to check the state of each battery in the pack. Battery 1 tested with absolutely no charge whatsoever but on the other hand battery 2 tested with a full charge. At this point I figured I might just be looking at a single battery failure which is a little more believable than the "Ehh, it just don't work...go buy a new one" type mentality. From my experience with rechargeable batteries, it is unusual for them to go from a 100% charge to absolutely 0% charge all of the sudden. Typically they will return at least a tiny bit of power after being charged, even if only for a few minutes. Test 2 - Back to the charger: Next, I reinserted the battery pack into the same lifeless Wii remote and plopped it back on its charger making certain that it is lined up with the controller markings on the flat panel. My thinking here is that for some reason 1 battery was being charged while the other one was outside of the induction "range". Well, 5 minutes later...the red lights of disappointment were back. For the next test, I just simply moved the Wii remote over to the other side of the charger to see if it was being picky about what side was charging it. 5 minutes later...yes, you guessed it.....remorse was setting in. Test 3 - Closer look at the overall picture: Thinking about the induction charging system as a whole, 1 thing we know is that if the battery is not inserted into a Wii remote...it will not even attempt to charge the battery pack. This leads me to think that maybe something is taking place inside this controller that is stopping the 1st battery from charging. So from here I swap this battery pack out and install it into my other Wii remote. Afterwards I press a few buttons on the Wii remote and see that the blue LED's on the bottom of the remote light up, indicating that this battery pack has 50% of its life left....interesting. So I continue onward and place the device onto the black induction panel and begin waiting. 5 minutes later...10 minutes later...30 minutes later, I still have a solid red light indicating that the batteries are charging once again. Hell yea! To verify, I pressed a few buttons on the Wii remote to see that I now had 4 blue LED's, thus indicating that it was almost fully charged! Also, I had inserted the other "known good" battery pack into the suspect Wii remote and it began charging as nature intended. So what does it all mean?!?! I do not really have a guess as to what may have happened here but I do know that these induction chargers are certainly not perfect. Given my troubleshooting, one may say that I have a bad Wii remote. This is a possibility however, why when I switch the battery packs does the "bad" Wii remote charge perfectly fine. In any case, before you go and throw out your battery packs, do some simple troubleshooting as it may save you a lot of headache and money. 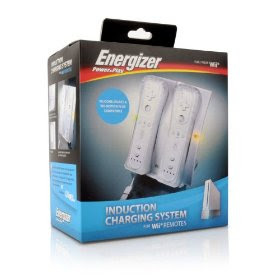 *On another note I did fail to mention (for the sake of organization in this post) that prior to this charger, I had purchased the previous model of this Energizer induction charger (see photo below) and I had ran into a similar issue with the red flashing light. When I called the manufacturer support line, they stated that the battery pack was bad and I could return the product. 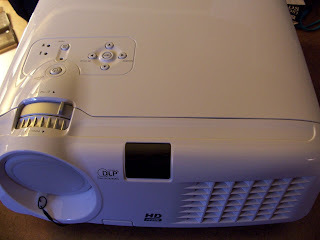 In any case I had tried the same methods above and DID actually get the battery pack to charge again but at that time, I just decided to return the older model and wait for the newer flat panel model thinking I would have better luck. I just used your method and yep, it worked for me too. I'm not sure I understand why, but hey, it beats buying a new battery... :) Thanks! I just posted some additional troubleshooting methods on a new post this morning. (Just click the "ALL OF THE ABOVE" heading at the top of this page to go there) If you are willing, please read through the process and give it a try. Hopefully this method may work for you. That is the damndest thing. Interesting enough, mine went to flashing red after I had re-installed regular batteries b/c the energizer were dead, and we wanted to play NOW. Then I reinstalled the energizers, and must've got them in their opposite remotes, hence the start of them flashing red. After reading this, I swapped them, and all is well. Business as usual. 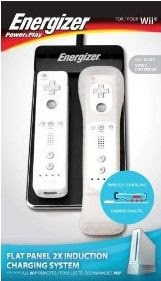 I wonder if cleaning the contacts of the battery and the Wii remote to make a better connection would work. I had this exact same problem except it looks like its the battery packs.. Each batter pack has had 1 successful charge, i had left them for about 2 months.. and they were completely dead, i tried charging them.. now they all flash red. Mine broke and I was seriously depressed. I just pushed it into the corner for about a year. I got back to it one day when I was cleaning and did some online searching. Apparently the induction wont work unless the batteries hold some charge. I got out my Radioshack AAA battery charger. I opened the energizer packs and dropped the batteries into the Radioshack charger. After about 10 min in the charger I put them back in the energizer pack and dropped it on the induction charger and it worked! In theory this should work with any NiMH AAA battery charger. Erik, your solution worked for me also, thanks! Excellent debug - thanks for the tips!! I've looked online for cheaper batteries but the only ones I can find are for the newer model of their induction charging station. I went through all those options you tried above to get mine working and didn't get anything to work. I've had my dock for maybe a year and had hardly touched either battery pack that came with mine. One still works absolutely fine and the other just won't do a damn thing. Guess the only option left might be to buy a new battery pack for it if I can even find one in stores! I purchased my PDP PL-7581 from Walmart a year ago. I recently began to see the red flashing light and my batteries would not take a charge. I called PDP customer service and they told me to send in the old batteries with a note indicating the problem and they will send out replacement new style batteries free of charge. I was unable to fix my batteries with these solutions, I did not have a way to charge the triple A's with a different charger. So what I did was called PDP, which was suggested in another comment. There was absolutely no problem getting a new set sent to me. I received them today but now i am wondering if these are improved from the older ones. I see the model number is 1 number higher, suggesting it may be fixed, I'm just wondering if anyone has experienced problems with a new set of batteries? P.S. I suggest if you phone PDP like I did, and they ask if you have the 2 or 4 controller dock TELL THEM 4! they sent the batteries to me without wanting the old ones, and I only owned the 2x charger! I had the red light of death also, and tried everything you all suggested. I got one to work sort of. I then called the number given above and the PDP people said they would send me two new batteries. This is free of charge and they didn't want the old ones back. Thanks Erik, your method worked for me too! I noticed a bad solder joint. it was weak, i pulled on the silver metal thing that touches the battery and is soldered to the board and it just moved and bent the solder easy. I re soldered it and now the fast flashing is fixed. Switching the packs to other remotes didn't work. But I tried to charge the pack by itself, without the remote, for about 5 minutes or more then put it back in the remote to charge, all was good. To charge without the remote, you have to hold down a button at the bottom of the remote slot on the charger, and line up the battery pack with the prongs that come out. I just bought this charger in the 4 Wiimote format used from Kijiji... The original batteries were not that great... When I remove them from the packs, tried to charge them individually with an NI MH charger I got here, some would just make my charger go nuts with a flashing red light... (Not a good sign)... I would put them back in, to no avail... So anyways, I decided I'd change the batteries in the packs with fresh NI MH... The Energiser charger was still temperamental... I thought what a serious piece of junk that is ! Until I tried the following... There seems to be a design flaw in the battery packs... Don't know if they are all like mine out there, but I found that there is a battery that doesn't make acceptable contact when installed in where it belongs... When holding the Wiimote vertically, and removing the pack to see the batteries in the pack, it's the one on the left (the one with the positive side facing down towards the sync button)... What I did was simply put some foil between the battery and the contact plate at the positive side before putting the thing back together (I suppose it would also work on the negative side but haven't tried)... Put back the remote on the charger and BANG!!! Bingo ! Working flawlessly ever since ! Would be happy to know if this was helpful to anybody !